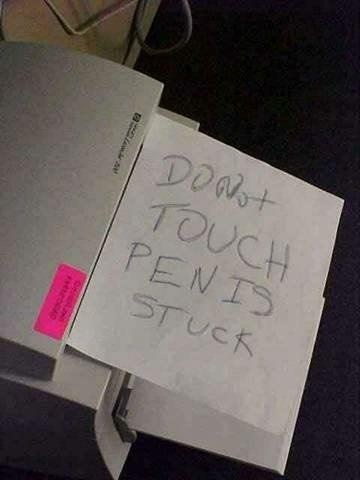 A co-worker got a pen stuck inside our printer while trying to remove a jammed piece of paper. He started to try and remove the pen, but I told him we don’t have time for that now, just put a note on the printer telling folks not to use it and then report it to the Help Desk. So he grabbed a piece of paper and scrawled on it. I left before he finished the note. About 20 minutes later, one of my techs comes in laughing and says he was just in the lobby, saw a piece of paper on a printer and went to investigate. Attached is what he found. Sometimes things don’t always come out the way you want them to…scroll down and see…..
We all need to smile every once in a while.